The Mediterranean Crescent Ring. Here is the classic crescent ring, made over using delicious Mediterranean-inspired ingredients. 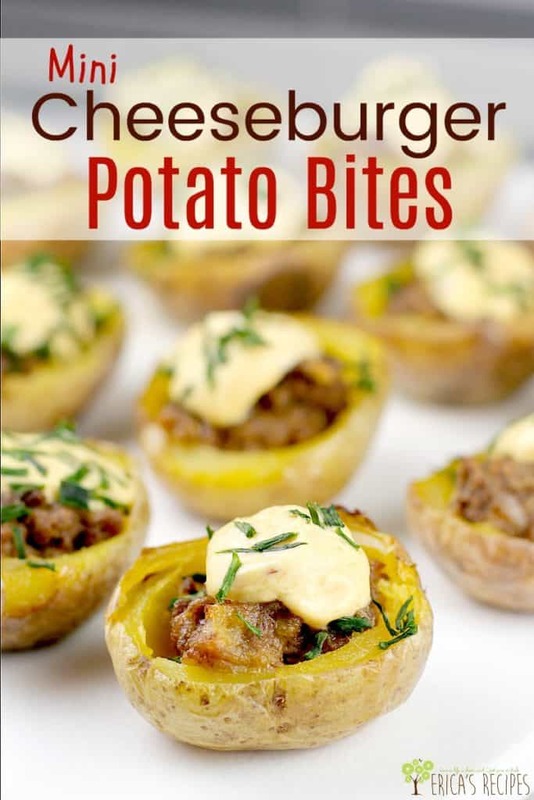 Need something new to bring to that breakfast potluck at work? This is it! I am blessed with a fantastic job, and I get to work with some really incredible people. My organization has its issues, like all do, but it has been particularly rough lately. So today I am just feeling this extra bit of gratitude for my “division” and the pretty special people I get to work with. One thing we do every once in a while is have a massive, gluttony-packed pot-luck breakfast. And my co-workers know I have no problem just making something up and using them as guinea pigs. Case in point: Jalapeno Popper Hash Brown Casserole. 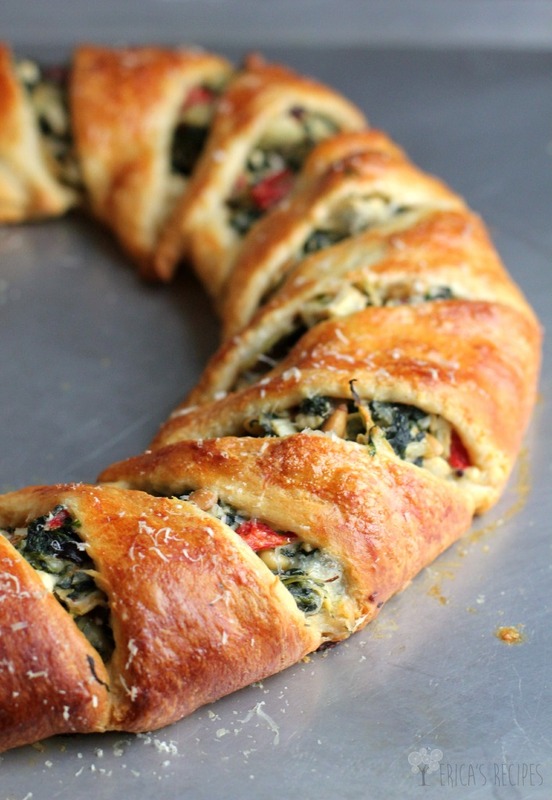 Next case in point: this vegetarian crescent ring before you. I literally made this up in the weeee early AM before the sun was even up, cooked it, delivered it, and waited for the verdicts. …and yes. It is, as we say, blog-worthy. The Pillsbury crescent ring. Everyone loves it, and 99% of people use the Pampered Chef recipe for it. 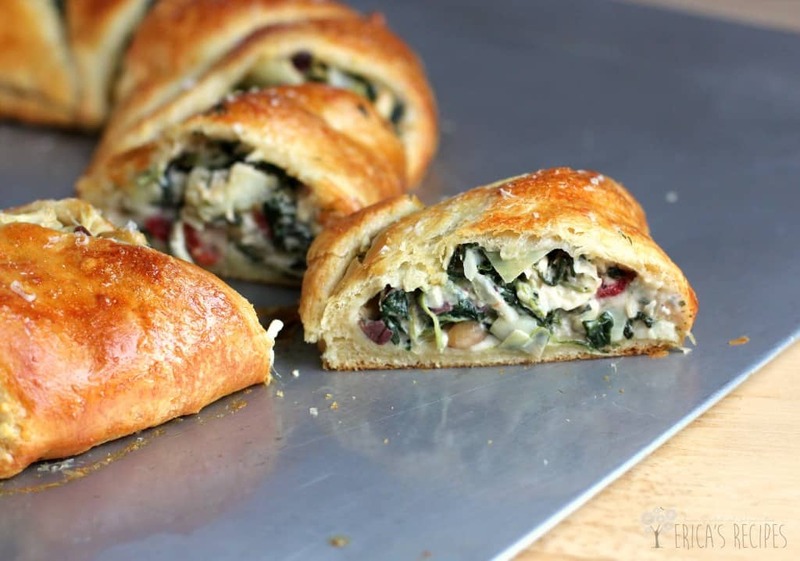 That recipe is essentially spinach-artichoke dip, wrapped in crescent dough. Yummy, but I wanted more. I wanted serious flava!!!! So, I went Mediterranean-ish so I could add pungent feta and olives and garlic and stuff. And some pine nuts for that smooth crunch. Yummeeeeee! 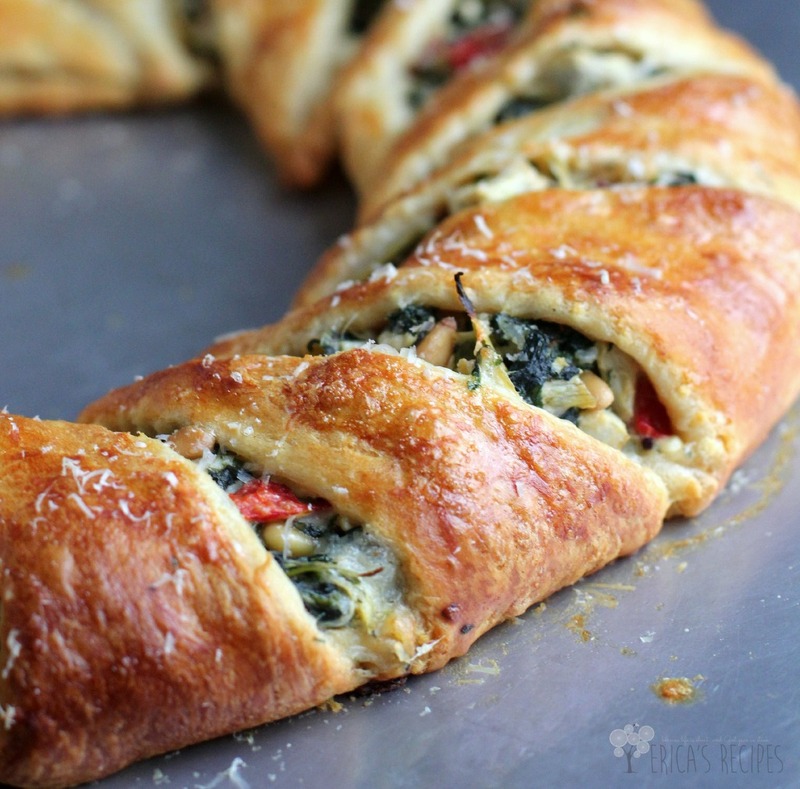 So make this Mediterranean Crescent Ring. 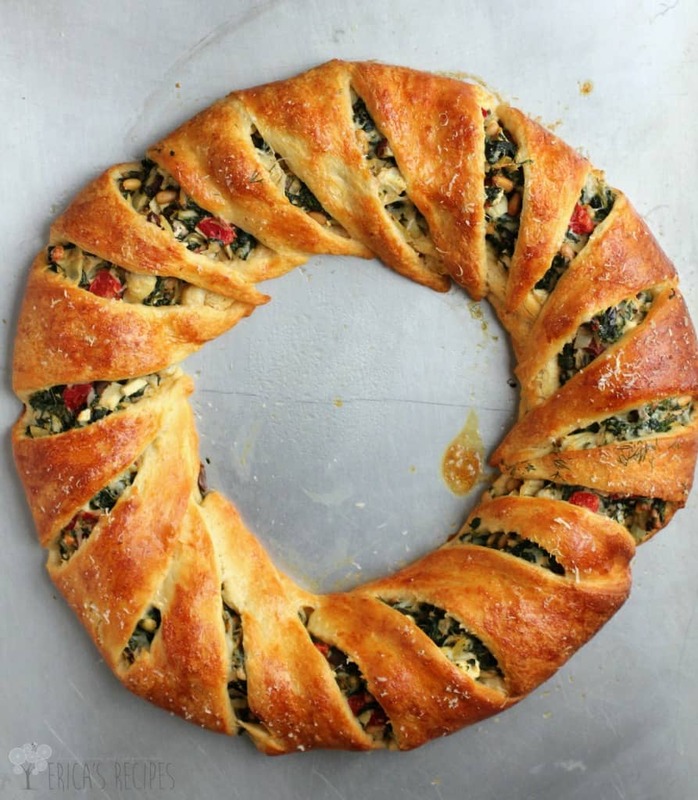 For baby shower, football, potluck, bunco, whenever – seriously make this crescent ring. It is delicious, different, and it will make people happy. And you will look like a rock star ….which is always our goal, right? Here are more potluck recipe ideas! The Mediterranean Crescent Ring. 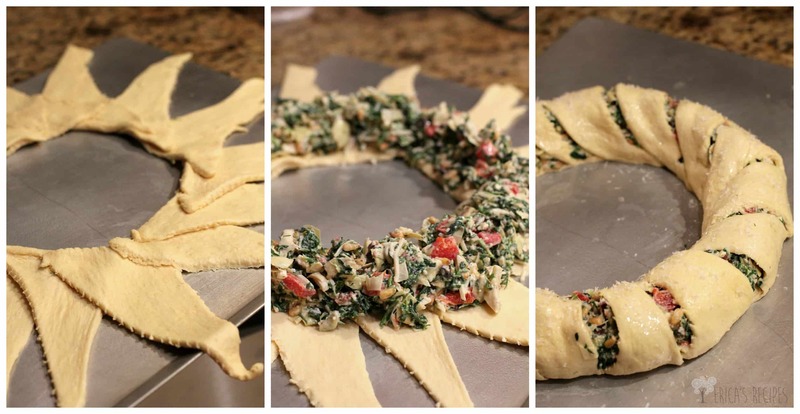 Here is the classic crescent dough ring, made over using delicious Mediterranean-inspired ingredients. In a bowl, use a fork to toss together the first 11 ingredients (up to and including the dill). Set aside. On a large bake sheet sprayed lightly with cooking spray, arrange the crescent dough, separating the dough into triangles along the perforations: lay the dough triangles, overlapping slightly at the corners, so that the short end of the triangles form a circle. Spoon the spinach filling around the circle formed by the overlapping dough triangles. Gently fold the long end of each triangle over the filling to form the ring. Brush the dough lightly with egg white and sprinkle with parmesan cheese. Bake at 375F for 20 minutes or until filling is heated through and crescent dough is browned and toasty. Slice and serve! Yields 16 portions. I cannot wait to try this. I’m thinking now on when I will be with a group who will appreciate it. I’m thinking a white wine would be great with this. This is so pretty Erica! I’m going to make this for a holiday party! The flavors sound amazing! 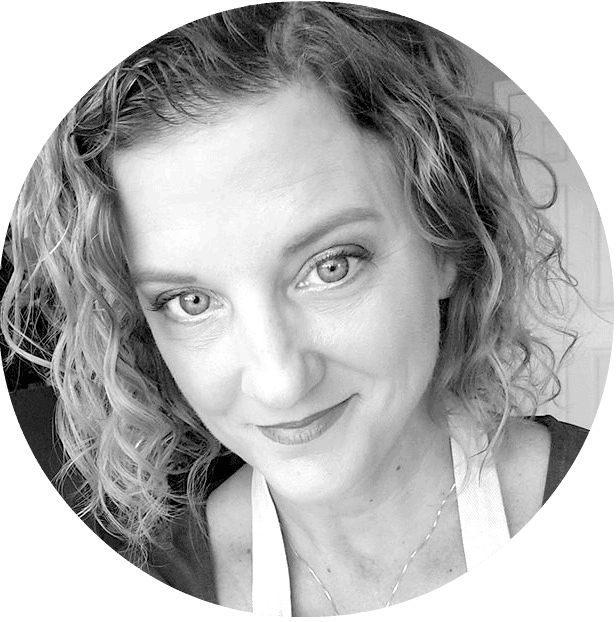 I fell in love with this when I started having and attending pampered chef parties WAYYYY back when! love your new take on a classic! 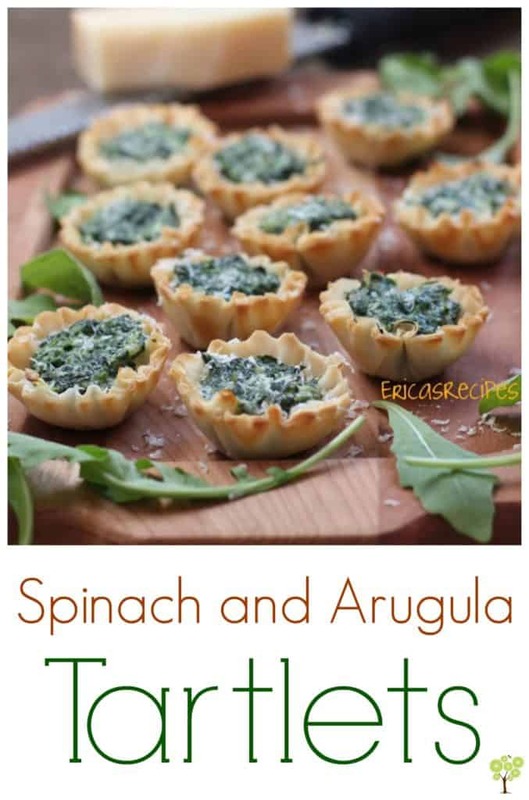 Erica, this looks absolutely amazing!!! I am always chicken to try things like this, but you make it look do-able! Pinned! Thank goodness for great co-workers, especially ones that like to enjoy tasty food! 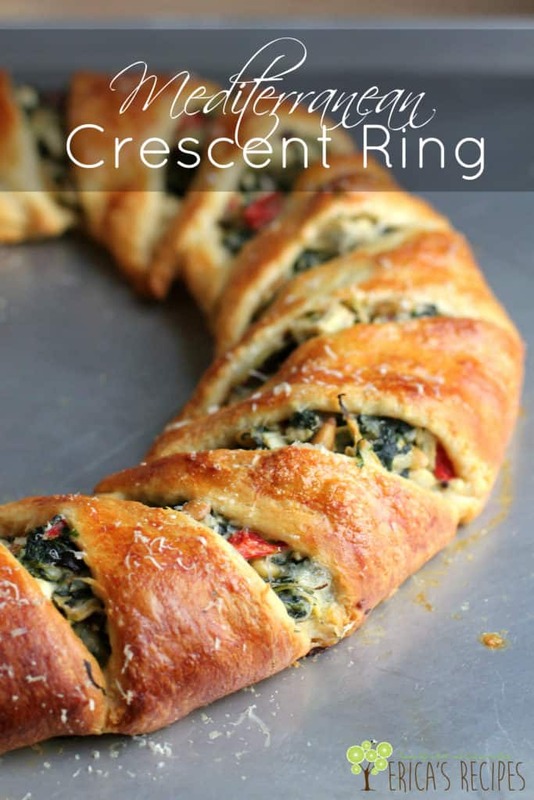 Love this crescent ring, and totally thought of my Pampered Chef party days (I used to go to a lot of them!). Your recipe is WAY better. Love that you added pine nuts! I can’t wait to try this! You really did “pump up” the flavors. This looks like a fantastic meal. I am highly considering heading to the store for crescent roll dough! And so pretty too! Wow, what a beautiful dish and it sounds absolutely delicious! These are always such a big hit and look so impressive! I love the flavors you used , Erica, sounds wonderful! Great idea! This looks really delicious, I bet you get lots of compliments when you serve it! Just gorgeous. This would impress the heck out of guests! Looks beautiful and delicious! Great idea! This sounds absolutely delicious and looks so impressive too!!! Stopping by from Foodie Fridays. You always have such amazing recipes! Love this one! Erica you seriously have impressed me with this mediterranean ring! I love pull apart breads so I can imagine that I would love this equally as much.. thanks for the recipe, it’s definitely one that I need to create! This looks awesome and delicious! I’ve never made a crescent ring but this is just too fantastic to not try. I love the flavor combinations in these…thanks for the step-by-step picture tutorial! Great tutorial and a beautiful result. Thanks, Erica, as always for sharing at #theWeekendSocial. Always happy to see what you bring to our table. Hope to see you again Thursday 9:00 PM EST. http://www.theKitchenChopper.com Pinned! This looks so impressive and I betting that it’s not too hard to make. Pinning. Thanks for bringing this to Weekend Bites. Erica this looks so fantastic!!! And impressive! Can’t believe how easy it is to make! YUM! 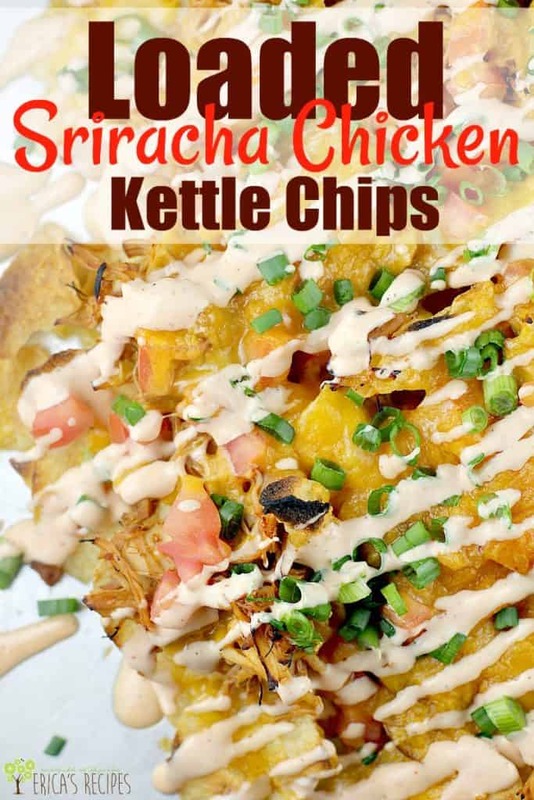 Thanks for linking up with us at #foodie Fridays!!! Great to see you on there as always! i loved the whole idea ! But…the crescent rolls are still just that…They still have that come-from-a-can taste…Sorry, I enjoyed the filling but I think the next time I shall try puff pastry cut into the appropriate shape. This looks so beautiful and sounds really delicious. I have to make this one. Thank you for sharing. I’ll let you know the verdict and post a pic if I am able. I just wanted to let you know that the Crescent Ring was a HUGE hit at our Jan 1st potluck! Everybody loved it. Can it be served room temperature? I am considering taking it to a potluck for which I have to travel and there will not be a way to warm it up. Is it too much to hope that it’s good after cooling? I made this last weekend and used a rectangular tart pan. It was perfect! I will be serving this for my mother’s 80th birthday brunch, and I’m sure it will be a hit. Hi! I’ve just discovered this blog so this will be the first recipe of yours I make! Sorry if it says this somewhere, but how many does this recipe serve? Want to make it for a party and am deciding whether to make 1 or 2! Thanks! Would it be bad if I ate the entire thing? Oh my gosh, Erica! I made this on Saturday to take to a friend’s dinner party as an appetizer. It was a huge hit and everyone wanted the recipe. I was lucky enough to hide one piece and I am having it for lunch today. This is my new go to appetizer. It would also be good for brunch…or lunch…or dinner! Hello! Is there a substitute I could use for the mayo?? I made it. It’s delicious! Any idea how many calories in a serving? And how many servings in this recipe?